When President Lyndon Johnson signed Medicare into law in 1965, he radically transformed the American health care system, establishing a firm link between public policy, public administration and medicine. In the intervening decades, the connection has only grown stronger, as Medicare expanded and the public demanded increasing oversight of the industry. President Barack Obama changed the discussion once more with the passage of the Affordable Care Act, which created new limits on the health care industry and the Patient’s Bill of Rights. The discussion about the intersection of public administration and public health policy centers around several very important topics. The government’s role in health care is divided into two segments: macro and individual administration. At the macro level, the federal government addresses health issues that impact the country’s health policies as a whole, and how U.S. policy affects the world. Recent examples of macro health issues include funding for the research and prevention of the Zika virus, funding for the Centers for Disease Control, and the government’s response to the Ebola outbreak. Problems at the macro level are primarily about funding; how much should the government spend on a program, not whether the program should exist at all. The individual level is where public administration and health care have a deeper causal relationship. Some of the recent discussions about individual issues include the Affordable Care Act and consideration for mandatory vaccinations. Public administrators are necessary for the writing and passage of any law that determines government involvement in health policy. Because public administrators have intimate knowledge of the health care system, they are able to provide expert advice and analysis to lawmakers that helps create more effective legislation. Public administrators are also critical in repealing or replacing laws that no longer work. In addition to oversight from federal agencies, doctors and hospitals must conform to numerous federal and state laws. Public administrators play a crucial role in the oversight of doctors on two levels. First, administrators work with the federal government to enforce the laws that are in place, and ensure the legislation is working as intended. 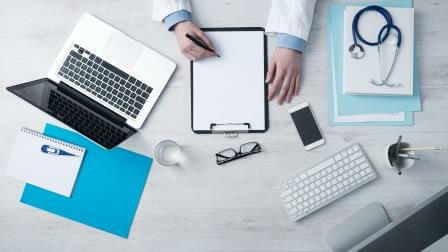 Second, public administrators work hand in hand with doctors and health care professionals to make sure organizations are following government regulations at all times. The need for public administrators to fulfill the second role is one of the reasons for the intense debate about health care policy, as critics of the role of government claim that the reason doctors need administrators on staff is because the burden of following the regulations is too much for doctors to handle on their own. One area where public administrators are making significant improvements involves the SDH, where the government addresses the underlying causes of poor health, before problems arise. SDH cover many different aspects of a person’s life, such as: education, environment and food security. Let’s Move designed as a program to educate children about the need to exercise and eat healthy food, the program made strides to end childhood obesity. In the future, public administration will continue to strike a balance between traditional methods of oversight and efforts and prevention through environmental factors. For generations to come, and the country will require a steady stream of qualified public administrators with deep knowledge of the health care system to enforce regulations. In the meantime, public administrators continue to shape the debate and affect policy at the highest levels of government. Our online Master of Public Administration at Ohio University can help you build the skills to address public needs in effective, efficient, and imaginative ways. We want you to take the big ideas in your head and put them into action by helping you develop as a project manager, communicator, policy analyst, and financial mind. When you have an expert understanding of public administration and the professional tools to back it up, you can lead a career of consequence for your constituents.